During the last year, South Somerset District Council (SSDC) has been working on a strategy to help regenerate our town centres. Plans are already underway in Yeovil and Chard, and now they have engaged a consulting firm to produce one for Wincanton. In early December 2018, the Area East Committee approved a draft strategy for Wincanton which was published today on the SSDC website, and made available for public consultation until Friday 1st March 2019. The draft will be made available to view and provide feedback on in person at a public consultation event in Wincanton Memorial Hall this weekend. Members of the project team will be there to answer questions and receive your comments and constructive criticism. What is the Wincanton Town Centre Strategy? According to SSDC, it’s a strategy to boost footfall and help create a more vibrant town centre in which Wincanton’s businesses can flourish. It comes with an action plan of ideas on how all this might be achieved. The document explores opportunities for investment from both private and public sectors, coordination of complementary town centre activities and improvements, promotion and marketing of the town centre and the development of partnerships to collaborate on implementing the strategy. The team welcomes particularly feedback on suggestions for public realm improvements such as widening footways, changes to surface dressings, planting schemes and better delineation of on-street parking. Attention has been given to specific locations including Market Place, the central High Street area and Carrington Way. Just like when the Neighbourhood Plan draft was approved, now it’s up to Wincanton residents and business owners to check it out and give feedback, suggestions and constructive criticism. You can do it all online, above, or you can turn up to the public consultation event in Wincanton Memorial Hall this Friday or Saturday to do it in person. 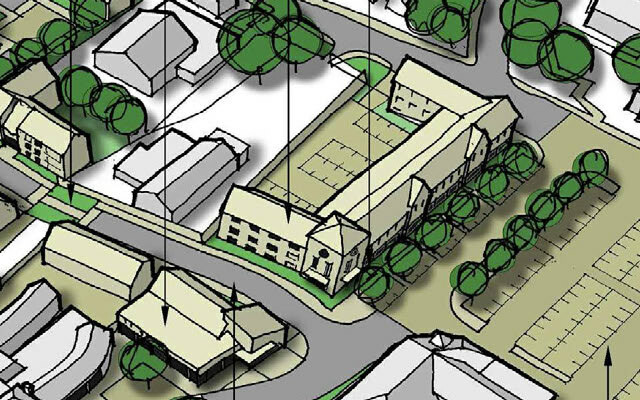 Past efforts to bring about change in Wincanton may be perceived to have had limited impact. What’s noteworthy in this case is that SSDC has instigated the project themselves, which could be interpreted as a sign that they’ll be willing to throw real money and authority behind some of the recommendations made by the independent professional consultants they’ve commissioned. On the whole, I think the plans are very good. Wider pavements, more trees, etc and I like the idea of a market square. There are all kinds of ideas that can come out of a market square. In one town in Germany there is a food market with a small area to eat - people can buy their lunch ingredients at the market. There is a small hut from which drinks are served, with different local breweries running the hut a month at a time. Perhaps we could have different food pop-ups running each weekend. The road running beside 7 High Street - does it have to be a road? Wincanton is blessed with lots of lovely little paths that lead about town. I can see that a road might have to come off Carrington Way to get to any new development, but I don't see why it has to lead back to the High St. I think the emphasis should be away from roads that take cars - more cycle and footpaths. Looking at the plans, 7 High Street would loose ALL its back garden to new developments - houses at the back and a new large retail outlet to face the square. I'm in favour of NOT losing back gardens. It is a very large plot, so I understand the housing at the end of the garden, but I don't understand why we need another large retail outlet to consume the garden of this lovely building when we have several buildings that are empty. That doesn't make sense to me. The houses at the back look tiny, with 3 taking the space that is the width of the old Clementina's building (minus extension). If you are thinking of smaller housing to cater for an ageing population, then I urge you to look at the exhibition at the Design Museum, where Peter Barber has updated the idea of alms houses, creating small housing where people can meet and socialise at the front of their houses, based on Choumert Square in Peckham. This would be a perfect location at the end of the street leading from Carrington way.